I want a fairly easy way to BSOD a fresh install of Windows 7 or 8 on purpose. Preferably offline, with nothing to undo to get it back up and running again as normal, i.e. a reboot should fix the problem. The easiest way on Windows that does not require downloads or anything is actually built right into Windows. From then on, the key sequence RCtrl+ScrLk and then ScrLk again will trigger a BSOD. 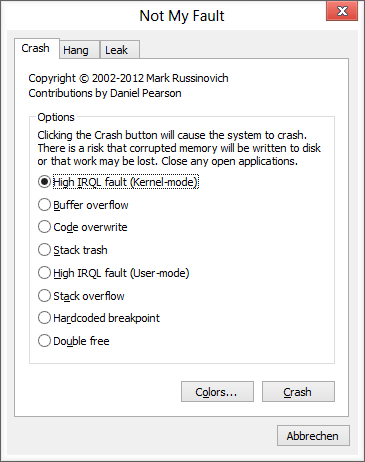 The only downsides is that the crash message on the BSOD states The end user manually generated the crash dump and some modern laptops don't have a ScrLk and/or RCtrl button. You can manually revert the registry key to be safe, but as long as you don't touch that key combination again (which is really hard to do by accident) it won't happen again. Run NotMyFault. Here you can crash the system with different bugchecks. Find wininit.exe, right click, and kill it. This works for Windows 7, not sure about Windows 8. As, according to the comments, this is for a prank, the Sysinternals BlueScreen Screen Saver is probably the best tool for the job. You could over tweak in bios, maybe RAM. This would allow for a easy reboot and get the message "press F1 for default start up settings". I cannot recall the process name off-hand, but I believe killing csrss.exe (while running taskmgr as admin) will instantly trigger a safe BSOD. Not the answer you're looking for? Browse other questions tagged windows-7 windows windows-8 windows-8.1 bsod or ask your own question.